Calling all shares speculators, traders and investors. You can now get real time shares quotes from google finance. Only 2 major US exchanges are supported currently which are NYSE and NASDAQ. 1. Searching for quotes directly from google or in google finance. 2. 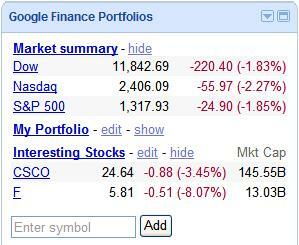 Adding a google finance portfolio gadget into your iGoogle homepage so you can follow your favorite quotes/companies. 3. Getting quotes updates directly onto your mobile. It sounds really promising and I wonder if Google has just stepped into some floor traders bowl. But consumers won’t complain about that, will they?